Star Trek is the first thing I ever loved. The year was 1987, and I was three years old, hopelessly enthralled with Star Trek: The Next Generation. 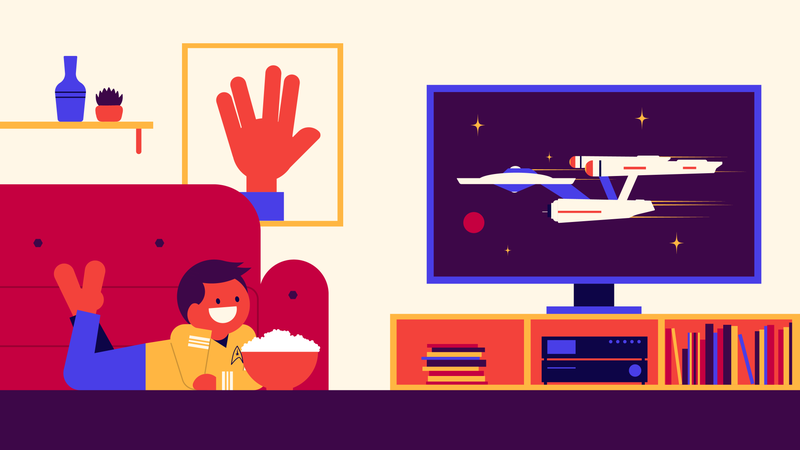 Every Saturday evening, my dad and I would huddle into “the TV room” of our suburban Long Island, NY home to watch the voyages of Captain Jean-Luc Picard’s starship Enterprise. New series like Deep Space Nine and Voyager fed my obsession, but it wasn’t until I started watching reruns of The Original Series when I was 12 that I knew I’d be a Trekkie for life. As an insecure middle school kid, the cast spoke to me: the unabashed confidence of Captain Kirk, the sarcastic wit of Dr. McCoy, and, my favorite, the logical half-Vulcan, Mr. Spock — an outsider doing his best to fit in with an all-human crew. The series made such an impact on me that I got a Star Trek tattoo when I turned 30. When Star Trek: Discovery – a prequel set a decade before the events of The Original Series – debuted on CBS All Access in 2017, I was thrilled. The second season returns on January 17th, and since it will connect back to the Star Trek canon (while still working as a standalone series), my excitement levels have shot up to warp factor 10. Here’s what I’m most looking forward to seeing. Star Trek: Discovery left us with a doozy of a cliffhanger last year. With the bloody Klingon war over, the U.S.S. Discovery is bringing home Sarek — the Vulcan ambassador to Earth and adoptive father of the series’ protagonist Michael Burnham. But when the crew receives a distress signal from another Federation ship, the Discovery stops to investigate. It encounters the legendary U.S.S. Enterprise right before the screen cuts to black. I’ve seen the Enterprise more times than I can count, but seeing the ship’s reimagined design —with its sleeker profile and grated warp nacelles — rendered in beautiful high definition, made it feel new. I can’t wait to get a closer look at the ship in season two, which hopefully includes the interior. Star Trek: Discovery takes place 10 years before The Original Series, and Spock is Michael Burnham’s foster brother, so I figured I would see my favorite Star Trek character on Star Trek: Discovery. The official trailer confirmed he’ll play a pivotal role this season, and I plan to celebrate by watching every episode in my Spock uniform (actually pajamas, which I wore to a work costume party once). In the same trailer, we also learn that a strange being known as “the red angel” has shown Spock an apocalyptic vision, and it’s up to him and the Discovery crew to save the galaxy. Since little has been established about Spock’s life immediately before the time period covered in The Original Series, it’s going to be, well, fascinating (Spock voice) to see how this harrowing experience might reinforce — or possibly challenge — his devotion to Vulcan logic. Christopher Pike may have only appeared in two episodes of The Original Series (not counting the unaired pilot, “The Cage”), but fans still celebrate his legacy as the Starfleet officer who captained the Enterprise before James T. Kirk. I’m excited to see him in the new season of Star Trek: Discovery. I’m also eager to see his gold uniform, which is similar to Kirk’s and a subtle reminder that Star Trek: Discovery inches closer to The Original Series era. We’ll also get to know another rarely-seen Enterprise crew member, Pike’s first officer, known only as “Number One.” Star Trek is good at revisiting characters and providing deeper backstories, so I’m eager to learn more about the Enterprise’s female first officer and to see Rebecca Romijn’s take on the iconic role. When Star Trek: Discovery premiered in 2017, the Klingons – one of Trek’s favorite on-again, off-again villains – were missing the luscious locks they’re known for. Some fans theorized that the particular Klingon factions seen in Star Trek: Discovery shave their heads in wartime, while others think the show was just trying out a new look for the warrior race. But the Klingons seen in a trailer released during New York Comic Con are back to their hirsute selves. We might get the reason this season, and it wouldn’t be the first time changes to the Klingons’ look have been addressed on-screen. Star Trek: Enterprise explained that their human-like appearance in The Original Series resulted from a genetically modified virus. If Star Trek: Discovery does provide context behind their new look, fans would get another intriguing layer to the Klingons’ backstory. Captain Georgiou — that is, Captain Georgiou’s double from the evil Mirror Universe — is back helping the Discovery crew this season after joining Section 31. As Starfleet’s black ops division, Section 31 has been known to stoop to some highly questionable tactics that often contradict the Federation’s evolved morality. I’m interested to see how Star Trek: Discovery handles this philosophical conflict because I’ve always believed Star Trek, while optimistic at its core, is at its most compelling when tackling the tougher questions of living in a utopia. I could probably write a novella on why I’m pumped for the new season of Star Trek: Discovery, but I also want to hear from you. Tell me in the comments why you are excited for season two, and be sure to catch new episodes starting January 17 on CBS All Access. Not caught up on season one, or any Star Trek at all? You can get into Star Trek: Discovery without my encyclopedic knowledge of the franchise. The complete first season of Star Trek: Discovery, as well as the entire Star Trek TV library, is available to stream right now on CBS All Access.